By Robert V. Bornino, Director of Satellite Testing Services, NTS, Los Angeles. All rights reserved. The satellites above us watch over us, assist in understanding our world and the universe, test new theories, provide positioning for locating devices and globally connect the world’s telecommunication systems. Research satellites. Spy satellites. Communication satellites. More than 600 satellites circle the earth daily. How long they stay in orbit is an ongoing question. Unlike a planet, the life of a satellite is often determined by two key factors: how much fuel is on board to fire the small positioning rockets that keep the satellite in orbit, and how long the power source for the onboard electronics and other systems continues to function properly. When the fuel is gone or the on-board systems fail, the satellite is retired or functionally shutdown. Eventually, because the small attitude rockets no longer hold it in the proper orbit, gravity will the satellite down to Earth. If it is small, it burns in the atmosphere. If it is larger, it hopefully lands in the ocean or uninhabited land. Since satellites cost hundreds of millions or even billions of dollars early retirement has significant monetary consequences. The reliable performance and long life of satellites is a paramount issue in several industries including defense, telecommunications, weather and GPS-based transportation. The investment capital involved is high and so is the risk. Instead of amortizing a $500M investment over 10 years, a premature satellite retirement after only five years doubles the operational cost. It can also affect how our world functions. Satellite TV programs could be interrupted. Voice and data communications could drop out. Losing satellite visuals, large icebergs could slip into shipping lanes unnoticed. Obviously, standby replacement satellites are not an option as they are expensive to build and launch. In addition, they quickly become obsolete if not used. As a result, the operational reliability of satellites is a major concern, and the cause of satellite failures is constantly under investigation. The latter function is often a difficult task because failed satellites typically remain in orbit or disintegrate upon reentry. As you might suspect, the investigation into the failure modes of today’s satellites is an intense scientific endeavor. And there is progress: A prominent failure mode has been pinpointed. It is the failure of the solar panels that convert sunlight to electrical power for the onboard satellite electronics and other systems. Solar panels are the primary energy source and absolutely critical to all on-board instruments, circuits and motors. One unofficial survey puts solar panel failure as the cause for 40% of satellite failures. 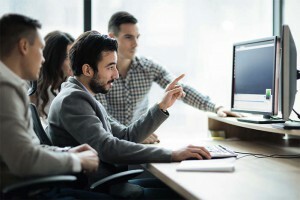 However, the number is difficult to confirm because each manufacturer is reluctant to divulge proprietary failure statistics and possible causes. Solar panels, like all components of a satellite, are designed to deliver maximum performance using the lightest physical construction possible. Weight is always a prime consideration because the life of a satellite is based on how much fuel is on board for the positioning rocket motors. The lighter the payload, including the solar panels, the more fuel can be stowed on-board. If the solar panels fail first, the on-board systems fail, and ground control is faced with declaring another early satellite retirement. The amount of fuel remaining for the rockets becomes unimportant. So why do solar panels fail? Satellites in orbit repeatedly go from intense sunlight to the cold darkness of space as they circle the planet. The temperatures they are exposed to rapidly change from very cold, -100°C (-148°F) to very hot, +120°C (248°F). It was assumed these radical temperature extremes stress the materials that make up the solar panels causing failures. These specifications continue to be updated and modified with the goal of standardizing the test parameters used by manufacturers to evaluate and improve both panels and solar cells. Reliability and functional testing of the solar panels follows these standards, which have also effectively created a basis for product comparison. While panels have been subjected to vibration and shock tests to simulate launch characteristics, they have not induced panel failures nearly as often as thermal cycling tests. These tests, run at environmental test labs including National Technical Systems (NTS), have verified the assumption that some of the materials used in constructing solar panels do not tolerate the rapid temperature swing. The material properties change over time, and eventually the solar panel loses its ability to generate electricity. The induced failures have provided manufacturers significant information about the characteristics of the various panel materials and possible improvements. Today, scientists continue their investigation to find new and better materials primarily to improve operational reliability and long life. 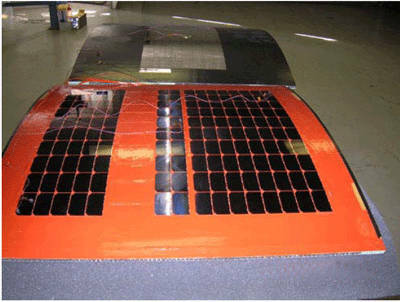 However, they also seek to lighten the panels to minimize the payload per panel. And, they endeavor to use materials that are environmentally friendly, such as those having little or no harmful outgasing. However, there are some unresolved issues in defining the testing parameters. As noted, one of the most stressful tests is temperature cycling. The endurance of materials to these extreme thermal environments is constantly being evaluated to improve the panels and cells. The panel test samples are called coupons. They must be tested over time to replicate the number of orbital thermal cycles they will endure when launched. In fact, the standard recommends subjecting them to 1.5 times the number of mission cycles. Therein lies a challenge for the environmental test industry: the creation of a system to induce and accelerate the temperature cycling of the coupons. Polar orbiting satellites are placed in circular sun-synchronous orbits at altitudes of 700 to 800 km with orbital periods of 98 to 102 minutes completing a little more than 14 orbits per day. Multiplied by 365 days a year, then times 10, the expected satellite life in years, and the safety factor of 1.5, the number of cycles becomes significant – 76,650 cycles. The testing must be completed in less than 10 years if the results are to be timely, so the cycle time must be compressed. To accomplish this, the coupons are exposed to a temperature change of more than 20°C per minute. To induce the temperature changes, the test chamber’s thermal control system must rapidly cool or heat the coupons. The cold temperatures are induced with liquid or chilled nitrogen. The high temperatures are generated using the solar light source. The disparity of the scientific community’s estimate of the energy levels across the sunlight spectrum that a satellite will encounter orbiting the earth. The actual availability of a light source that will accurately reproduce the spectrum at those energy levels. To date, scientists have considered two types of sources for the tests: steady state such as filtered xenon or dichroic filtered tungsten and pulsed-type long-arc xenon flash lamps. IEC 904-9 for Photovoltaic Devices, Part 9 specifies three different light energy levels (A, B and C) that could be applied to the cells in the test coupons (Table 1). The cost of the light sources range from $30,000 to more than $500,000. Manufacturers have yet to agree on the energy range to be used in each test. Level C is currently used. The industry is deciding currently whether level B replicates the solar spectrum sufficiently to conduct an effective test or if Level A should be used. Level A would have a significant impact on the cost of the test system as a Level A source costs nearly $500,000. While the industry works to resolve an acceptable sunlight source definition, testing of solar cells and panels continues within the industry. On behalf of several panel and satellite manufacturers, NTS has conducted extensive tests on solar panels and cells. 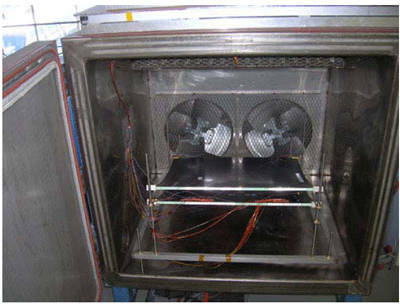 The dedicated test chamber constructed for the thermal cycling tests features special silicon windows to permit the exposure of the coupons from the exterior light source. The chamber has a positive-pressure nitrogen atmosphere to prevent oxidation of the coupons. The hot-cold cycles are created using the chilled nitrogen gas and the heat energy imparted by the sunlight source. Some coupons have successfully passed thermal cycling endurance tests using Level C light sources. Others have failed due to material degradation, which is then analyzed by the panel manufacturers to determine potential product changes. Over the years, NTS has generated thousands of data points for manufacturers, making it one of the most experienced labs in the field. 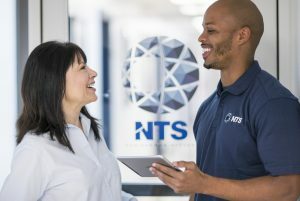 NTS personnel are committee members of the AIAA, working with industry partners to further refine the testing and evaluation standards for solar panels and cells. The goal is to establish a test procedure that is both cost-efficient to conduct and reliably effective in inducing and detecting materials failures. The dedicated NTS chamber is already outfitted with solar light sources and the lab plans to install the Class A or Class B light source as soon as the industry resolves the specification requirements. The simulator shall be capable of producing the standard irradiance of 1000 Wo m-2 (as measured with a reference device) at the test plane, and higher or lower irradiance levels as may be required. The spectral irradiance distribution of the simulator shall match the reference spectral irradiance distribution to the extent indicated for the relevant class of simulator in table 1. The irradiance in the test plane over the full extent of the designated test area, as measured with a suitable detector(s), shall be uniform to the degree specified for the relevant class of simulator in table 1.